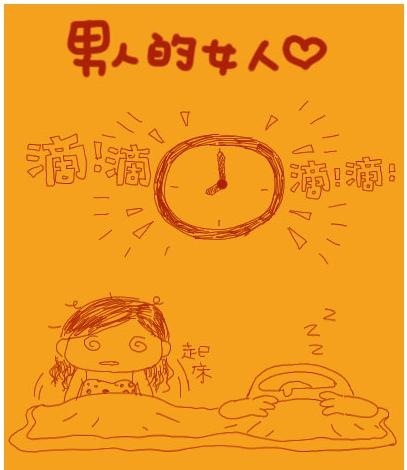 [Netease] The child who gets up the earliest in Changsha is named Maotuo, (毛坨) (nick name) earlier than the street sprinkler truck. 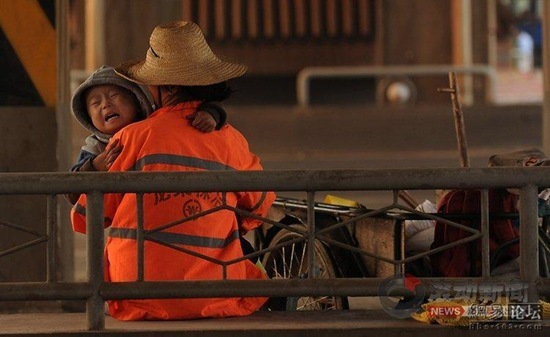 He is only 5, every morning at 4:30 am he is forcefully woken up by his mother, and carried onto a cargo tricycle. Then they are off to the streets. 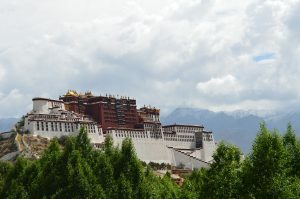 In late fall, the weather was chilly with heavy moistures. 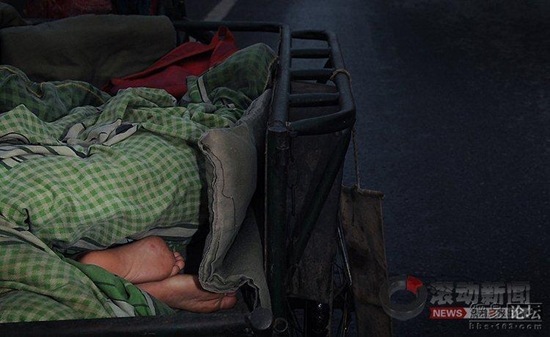 Young mother covered the cargo tricycle with cotton blankets the child laid down on top. 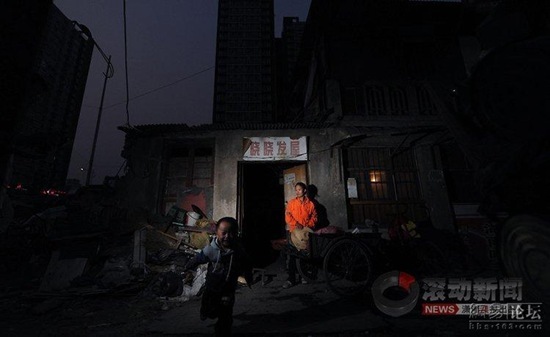 Maotuo was used to getting up early, mother needed to sweep the streets. 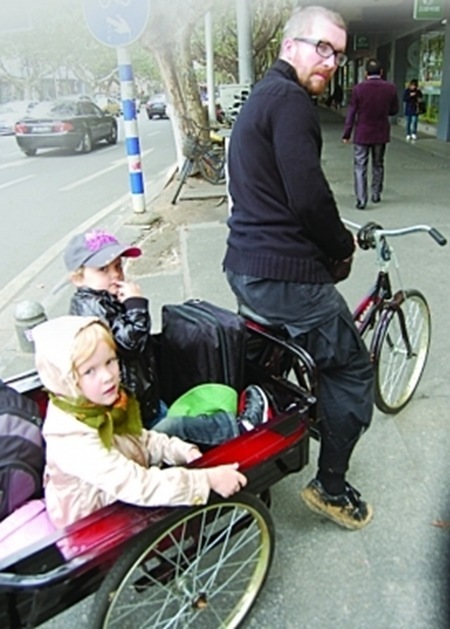 He understoods mom’s job, quietly sat on the tricycle and never made a noise. In the cracking sound of rocking tricycle, Maotuo fell asleep. 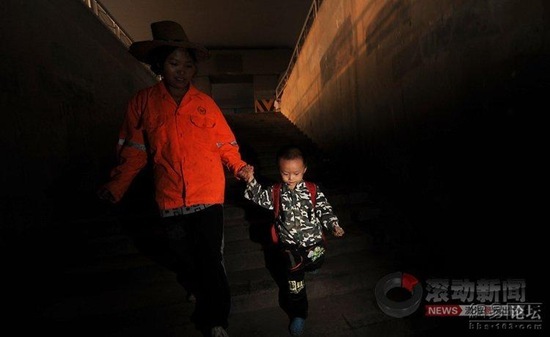 It was barely down, Mom brought Maotuo with her and began the day of cleaning under the overpass. 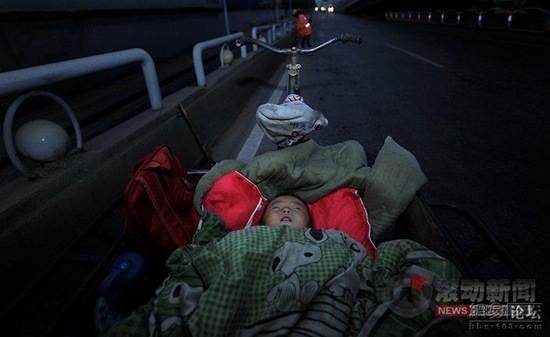 Maotuo was still asleep inside of the cargo tricycle. 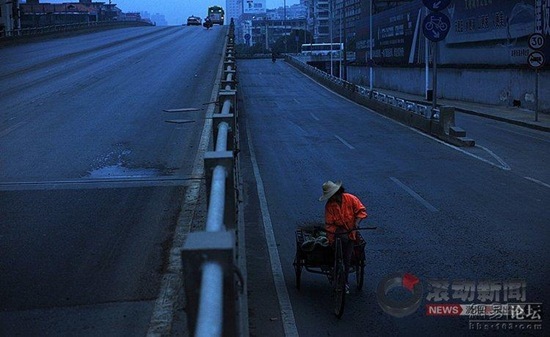 Would the roaring hums of vehicles passing by continue to be his childhood lullaby? 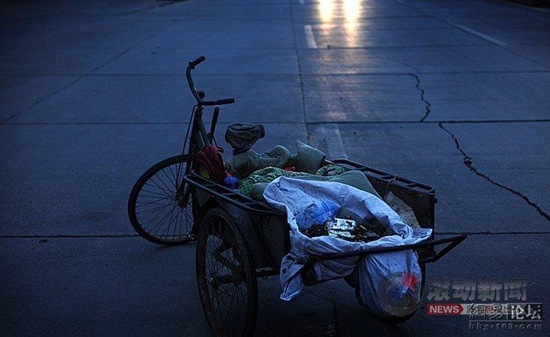 Every morning a little over 4 am, mother would unlock the cargo tricycle, bringing little Maotuo along and ready to begin a day’s cleaning work. On the way Maotuo was not feeling well, mom tucked him in. 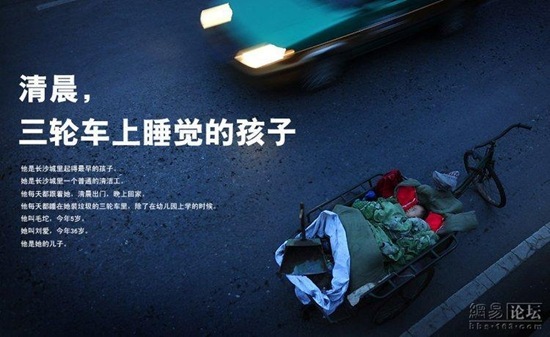 5 year old Maotuo was peacefully sleeping in the cargo tricycle, not far away mom was cleaning up the trash on the street. Maotuo deeply asleep, his feet was uncovered. 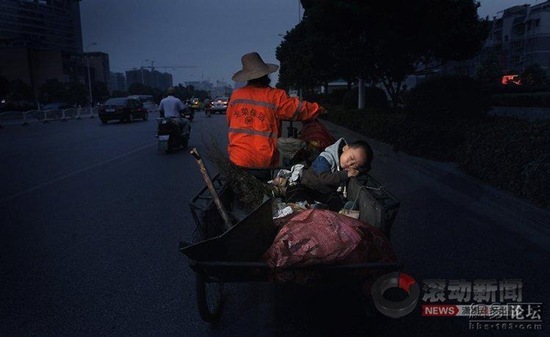 Maotuo continued to sleep on the cargo tricycle full of trash. 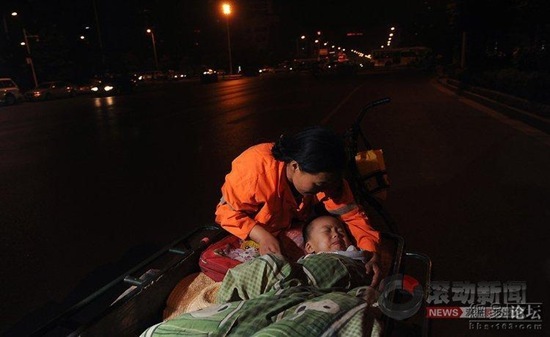 6 am, it was day light, awoken Maotuo sat in the tricycle, accompanied his mom to sweep the streets. Maotuo was still sleepy and yarned. 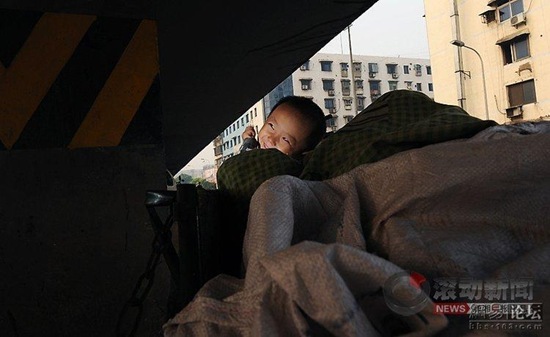 Under the overpass, Maotuo got a cold today, in the arms of his mom he kept crying and pleaded with her to go home. “Baby, be good! Mom will get off work soon, and we will go home.” Lui Ai (刘爱) tried to calm him down. 6:35 am Mother bagged garbage and hung onto the vehicle. Maotuo was playing in the tricycle by himself. While Mom was working, Maotuo was still playing by himself in the tricycle. 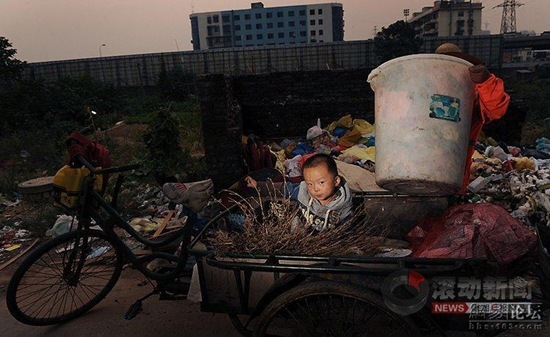 While mom was dumping garbage, Maotuo sat in the tricycle accompanied her. 7 am every morning, Lui Ai would find time to send Maotuo to kindergarten. 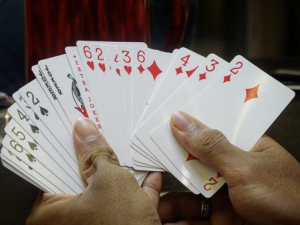 However, for various reasons the kindergarten would no longer accept Maotuo. His mother had to again find him another kindergarten. Maotuo was playing games with other kids in the kindergarten. In the afternoon, Mom picked Maotuo up from the kindergarten. 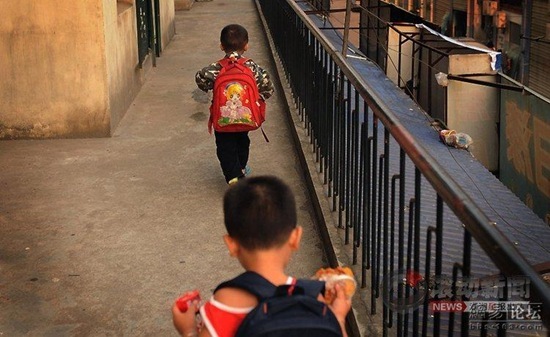 The school complained, “Maotue likes to take other kids’ food, Maotuo does not know how to write, Maotue smells bad…” He was removed from this school again. 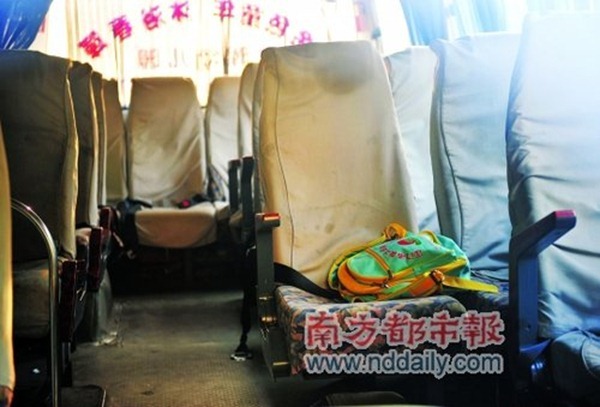 Mother said, after getting the 260 yuan back, she would continue to look for another kindergarten. 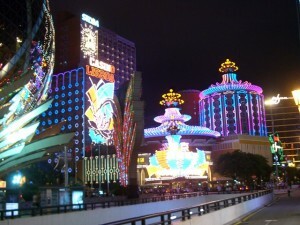 Their home was near Ma Wang Dui road (马王堆路). The house would be tore down soon, and they were going to relocate. Inside and outside of the house was a mess. 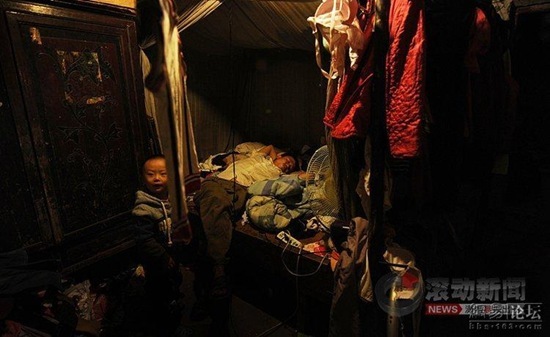 Maotuo and mother went back to the messy home and dad was asleep on the bed. The mother’s name is Liu Ai (刘爱). 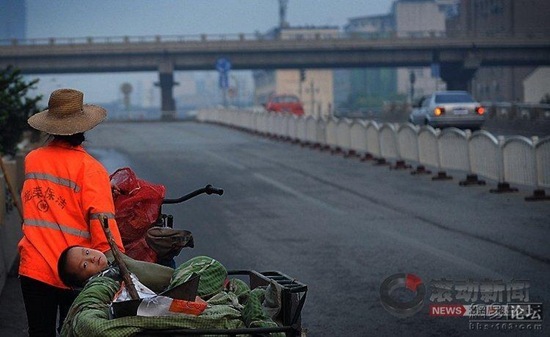 Her orange uniform had “Long Rong Cleaning” (龙荣保洁) written on it. In recent days, she received a notice from the squad leader. They were going to dismiss her. The reason was because her bringing a kid to sweep the streets. Mom calls him Maotuo (毛坨). Means “very cheap” (很贱); but he will grow up very well. 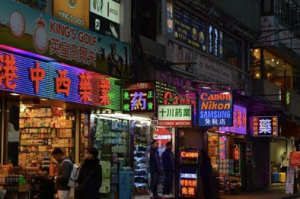 She believes Changsha’s custom of choosing a name. I hate to say this but while this child is quite sad, there are plenty of other children doing far worse. 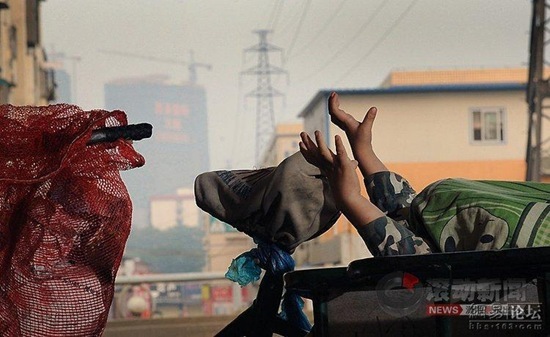 For those that have actually been to China, you’ll see young children on the streets begging for money. 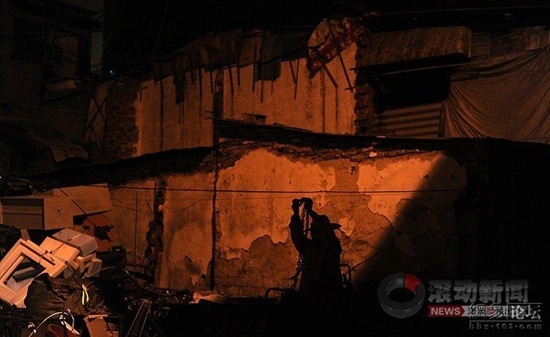 These child beggers are usually associated with some underground gang or group. These children are usually stolen from their families in the country sides and foced to beg in the larger cities. 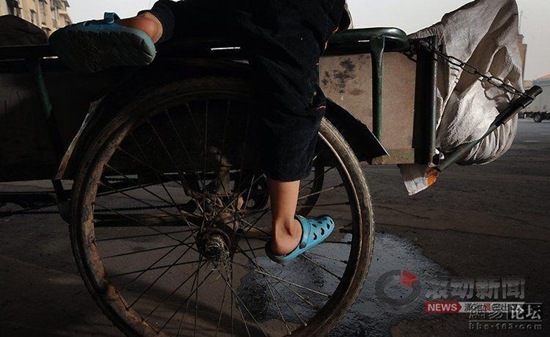 To make the children “better” beggers, they are forcefully crippled or physically injured. This way, people walking by will have more compassion for them and are more likely to give money. Each child is also given a daily income quota, if these are not, they are severely beaten. I took a note of this. Gosh..I cried. So poor yet so much love. beautiful baby boy.